Let your glass of wine stand straight up on the angled arm! This is made possible by this nifty little feature of the Baldwin Chair. 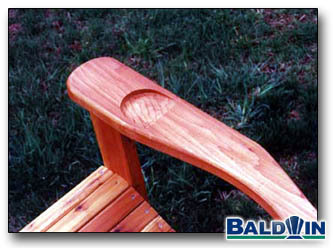 We use a router to carve in this 4" diameter level spot in the arm of the chair. Because most people are right handed we always put the drink holder on the right Arm Rest. Please specify on the Notes section of the order form if you would like the drink holder on the left Arm Rest. This will probably add a day or two to our otherwise next day shipping program.